The Pheasant Run tree plan calls for the removal of that oak you see left of center in this May 28 view looking north from Dover Avenue N.W. Two of those in the right background will go too. On a ride around North Albany the other day, I took another look at the site of the Pheasant Run subdivision the city council approved last month over the objections of neighbors who testified at a public hearing. When the subdivision proposal was announced in February, I took photos that showed the trees in winter. No foliage. Now you see those oaks in their full splendor. In the photo above, the tree left of center is designated as No. 51176 in the Pheasant Run “Tree Conservation and Setback Plan.” A table listing trees to be saved and trees to be removed shows this one, with a diameter of 42 inches at breast height, among those to be cut down. One of the oaks in the grove in the background will be saved, according to the plan. It is listed as having a diameter of 63 inches at breast height. The subdivision plan shows it sitting in the middle of a tract — bigger than the surrounding home lots — that will not be developed. Two others in the vicinity (with diameters of 40 and 63 inches, respectively) are slated to come down. Albany has a tree ordinance that says felling permits may be denied for various reasons including “scenic quality.” But the city staff agreed with the applicant that under state law to encourage construction of “needed housing,” the city standards were not sufficiently clear to require preservation of the stately trees. The table in the development’s tree plan says that on the site itself seven deciduous trees and four conifers are to be removed and 19 deciduous trees and one conifer are to be preserved. Five off-site conifers are to be cut. The council approved the 147-lot subdivision, to be developed by Hayden Homes of Redmond, on May 9. The preliminary plat shows it to be developed in four phases, but it’s not clear (at least to me) in which order or when. It always breaks my heart when a healthy, lovely tree gets axed. I know the need for housing is great, but it still hurts. Is there no way to save them and still build the houses? I suppose I sound like a “Pollyanna” but I have to say I think trees should be saved if at all possible. To bad someone isn’t planting some oaks so in a couple hundred years or less they would be that big. Those large trees, unfortunately, are approaching their life span. And just how much needed O-2 will that subdivision put into our breathing atmosphere? Those buildings are D-E-A-D & contribute nothing but off gases! That tree is a living entity & benefits all of us! It’s sad as that tree has endured thru the years to silently provide us with literally a life support. You can’t tell me that the developer couldn’t work his money fingers around a way to save that tree. Heritage Mall did it with their big oak! People don’t they understand the importance of trees. How they create oxygen for all of us to breathe. How they give home to wildlife. When there are enough of them they draw rain. Trees are so important. I am so sad that the trees are leaving. We have a need for housing and an equal need for something else that’s a little harder to quantify but no less important. Please save the oaks. This planet supports our lives, and the planet is in trouble. But, our stupid council cannot see beyond their own interests. At least when we are all dead from global warming and lack of oxygen, the council members will be dead, too. We need trees more than we need new houses in North Albany. The council should be on a campaign to get people to live in their housing development on the river off Water Street where their CARA money went. I don’t see any activity there to speak of. People do NOT NEED to live in North Albany in $750,000 and up homes!! A need for housing! There is no “need” for more housing out here! It is already way over crowded! For the record, I voted NO to this housing development. Largely because of the trees. Well, yes, trees stand in the way of progress everywhere. If you look back on the history of the Willamette Valley, it was all trees and swamps before the white man came. Progress happened despite the trees and swamps. In my opinion though, my current big concern of the N. Albany developments by Hayden homes and DR Horton is that they slap together a cheaply and poorly made house which is shoved into a very small lot. Geez, you can’t even have two way traffic on the developments streets when cars are parked on both sides. Then, there is the lack of improvements for the extra traffic on the existing connector roads. I also wonder if the schools are ready for all the extra population of kids. My 2 cents worth. I agree with your Big concerns 110% with one exception. Cheaply and poorly? Proof? In my double wide frame of view, they seem structurally fine. Inspected and all……. Nothing wrong with narrow streets, especially if you want to protect trees, have open space, and have reasonably-sized backyards. You can’t use the same land to serve cars, and also serve everything else worthwhile. Recently I found an article on internet called “What’s so special about Oregon White Oaks” that is worth reading. 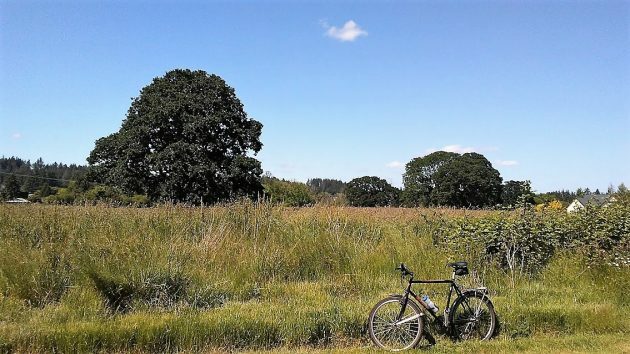 I read “During the 1880’s oak savanna was a common sight in Willamette Valley. Mature oaks provided an abundance of food for the Kalapuya Indians, who used the tree’s acorn to make meal.It’s large acorns mature in one season, ripening from late August to November. These trees fit that pattern as open-grown. Wonder what the developer will find under those trees. The article was written by Cynthia Orlando, Public Affairs Specialist.